Since 2008, we have donated over $31,000 to various charities from donations made by our customers into “Conscience Fund” donation buckets located at the registers in the Farmstand. All of the donations receive a 10% match from Parlee Farms. 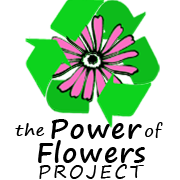 We donate to a different organization each year and our 2017 recipient is the Power of Flowers Project! The Power of Flowers Project is the brainchild of former marketing professional turned floral designer, Joyce Bellefeuille, and since 2009 they have rescued thousands of arrangements otherwise destined for the dumpster and delivered them—remade into close to 69,000 individual signature bouquets—to shut-ins and others in need of a lift. Their arrangements can be found everywhere from bedsides in nursing homes to coffee tables of Meals on Wheels clients, from the hospital rooms of the critically ill and disabled veterans to the rooms of homeless mothers and from community meal sites to the desks of under-appreciated helpers. • Donated flowers are picked up by volunteers. • The flowers are refreshed, renewed and made into smaller floral designs in cups that are 100% biodegradable and made from a renewable source. • Hundreds of pounds of containers are kept out of the waste stream by selling them back into the floral industry for reuse. • Plant material is composted at the Power of Flowers workshop site location in Tewksbury. Volunteers regularly take home cardboard and plastics to recycle. The Power of Flowers Project has grown to include over 100 volunteers donating thousands of hours each year converting large arrangements into individual ones. Belle Feuille Floral Design has been sponsoring the program which has incorporated as a 501(c)3 charitable organization. At Parlee Farms, we love the generous spirit of this organization spreading joy through flowers to others. To learn more about the Power of Flowers Project, their volunteer opportunities, or to donate flowers, visit: http://powerofflowersproject.org/.